All Wisconsin Recreational Safety Students are required to obtain a lifetime DNR Customer Number. You will not be issued a Boating Safety Certificate without a DNR number. So why is it called a Wisconsin Boating License? Since many people are used to using the term "license" it's a natural assumption that you need a boating license to drive a boat instead of a boater education card. 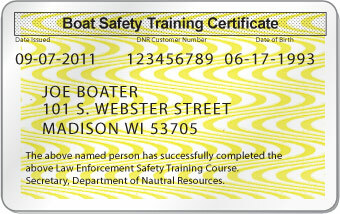 The Wisconsin Boating Safety Education ID Card is what you need in order to drive a boat on Wisconsin's waters. If you have NOT already been assigned a DNR customer number, or if you cannot find your DNR number, you can obtain your number from the DNR website.